Yesterday we entertained friends for "Gourmet Night". Gloria designed the menu; each of four couples were required to prepare and bring one item. Gloria made her famous Eggplant Parmesan. 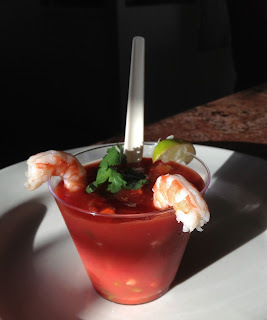 I wasn't obligated to cook anything, but the warm weather inspired to create some "Gazpacho", which is a Mexican-style soup that's served chilled. Everyone asked for my recipe. Of course, there is no recipe ... it was a trial-and-guess thing. But here I've typed out some instructions. To the best of my recollection, this is how to make "UncleGeorge's Gazpacho". I prefer to make my own puree from overripe tomatoes that are sometimes available at the local fruit stand. Now transfer them to an iced pot of water and the skins should crack, practically bursting off the fruit. You need two mixing bowls. Place a steel strainer over one bowl. Use your thumbs to break apart the parboiled peeled tomatoes over the second bowl. Release the free-run juice and seeds into the bowl, while trying to not damage the pulp. When the strainer is about half full, scrape the pulp over the strainer screen to "grind" it into the bowl. Discard any yellow membrane or hard tomato parts -- don't force them through the strainer. The bowl should begin to accumulate a beautiful heavy puree. Repeat until you accumulate about six pints. Now strain the free-run juice to remove the seeds. Refrigerate this juice, you'll need it later. I found some wonderful canned "ground" tomatoes at "Costco for Business" here in San Diego. They are the "6 in 1" brand, produced by Escalon. A big #10 can costs less than $4. I used these last night and nobody knew it wasn't fresh tomatoes. By coincidence, my favorite pizza shop in the world (Vince's in Philadelphia) uses this brand of tomatoes in its pizza sauce! Combine the vinegar, lime juice, salt, sugar, pepper, and dill. Place the onion, carrots, cucumber, garlic, jalapeño, green pepper in a mixing bowl. Stir in the pickling liquid and allow to stand for three hours. Stir cilantro into the puree, refrigerate for three hours. After three hours, stir the pickled ingredients into the puree. Taste it. It's great. But the flavors will intensify overnight. Refrigerate overnight -- you will eat your reward tomorrow!!!! Taste it. Adjust lime juice, sugar, salt, and jalapeño as desired. It's probably a little too thick. Adjust to desired consistency with some of the free-run tomato juice. Finally ... Enjoy Your Gazpacho! Last night I served it in clear plastic cups. Garnished with lime wedges, cilantro leaves, and shrimp. If you made fresh puree, that surplus tomato juice will make a great bloody mary!